Triumph (Formerly "Kutrimmers") heavy duty guillotine paper cutters provide top performance for small to large volumes of stack paper trimming tasks. You can depend on a precise and clean cut with these guillotine models. When cutting standard, legal and custom sized material -these models allow for a higher sheet count when compared to others on the market. Built to exacting specifications and standards you've come to expect from Ideal-MBM - you can depend on years of top quality performance from these cutters. Whether your running a print shop, graphics design studio or copy centers - this equipment was designed for professional commercial use, but can be used for general office tasks as well. Each model uses a Solingen Steel Blade which can be re-sharpened if needed. They have been designed with both ease of use and safety in mind to ensure top performance. Unlike other brands on the market, Triumph (Kutrimmer) use metal component construction over most of the parts. Pressure clamps and contact points are made from metal - not plastic like other fellows trimmer brands. The components will not wear with use, and provide the same precise and accurate cut time and time again. The quality and performance of these commercial models is well known in the print trade industry, and they are widely used through out the world. 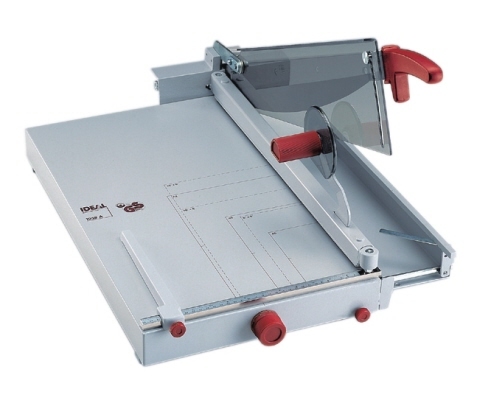 Kutrimmer table top guillotine paper cutters are available in models: 1134, 1135, 1038, 1040, 1046, 1058 and the 1071. 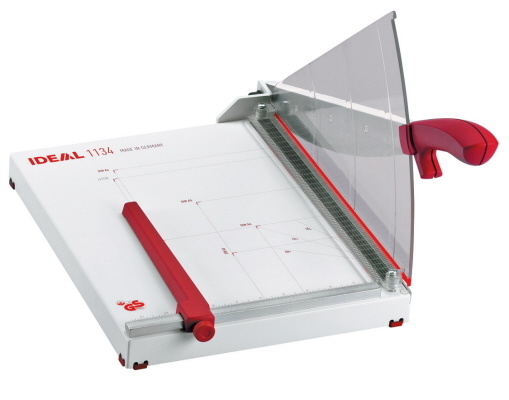 The Kutrimmer 1134 Guillotine Paper Cutter is a light to medium duty trimmer model designed with safety and performance in mind. This line uses a Solingen Steel Blade set which acts like a "scissor" to provide a clean burr-free edge with every cut. Designed for professional, office, or commercial use - all models in this line use a pressure clamp and back-stop to hold paper in place to ensure accuracy. 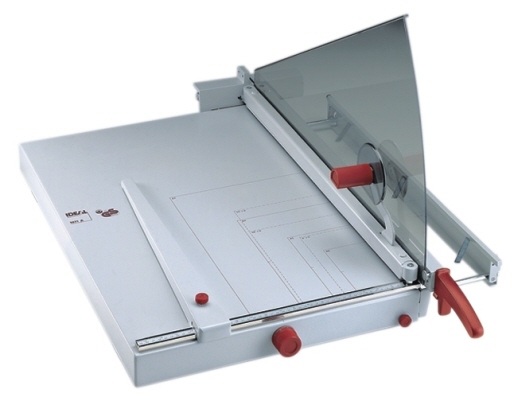 The Kutrimmer Triumph 1135 Paper Cutter Trimmer - from Ideal-MBM, is also an easy to use model with Lexan® safety guard and cut line indicator imprint. This table top model fits in nicely with any contemporary office decor and is precision crafted for longevity. The main difference between this and the 1134 model is this unit includes an automatic clamp with "Easy Lift" release for removal of processed paper. The Triumph 1038 (Kutrimmer) Paper Cutter is a heavy duty compact table top model designed for cutting up to 50 sheets of paper at a time. This model includes a standard back-stop and adjustable front gauge for fine tunning. 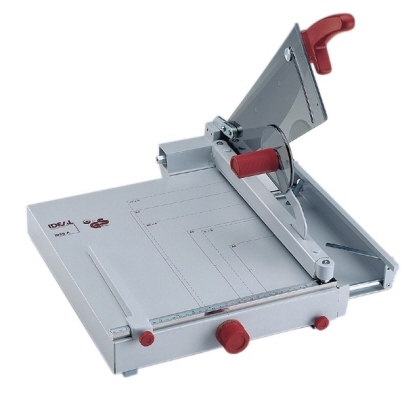 This model also includes a narrow strip cutting device for fine cuts of material. The Triumph 1038 (Kutrimmer) long lasting Solingen Steel blade can be resharpen professionally and is housed on a solid cast aluminum bracket with double pivot bearings for the blade axes. 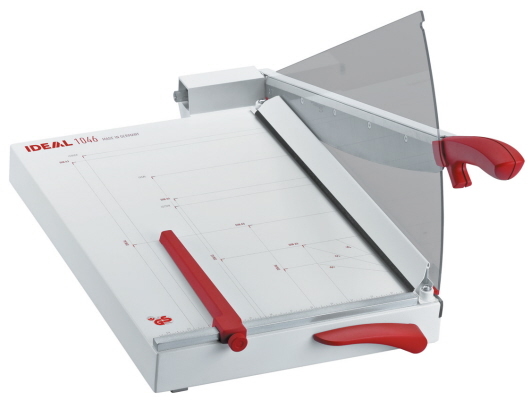 The Kutrimmer Triumph 1046 is a heavy duty paper cutter which provides a generous 18" cutting width for larger tasks. With a 30* sheet stack capacity, and the easy lift clamp - you can perform perfect a trim every time. Built upon the same great features as the smaller sized models in this class, but with the larger work area. This unit is still light enough at 24 lbs. to move and store as needed. The Triumph 1058 (Kutrimmer) 22 1/2" Guillotine Paper Cutter is built on the same great features as the small brother in this trimmer line - by Ideal-MBM. With support and waste tray which folds away, you can adjust for finer tasks on larger format material. Accommodating paper cutting sizes of up to 22 1/2", this large format model can easily be moved since it is lightweight at only 42 lbs. It can be used on a desktop or table top for proper height and leverage while working. 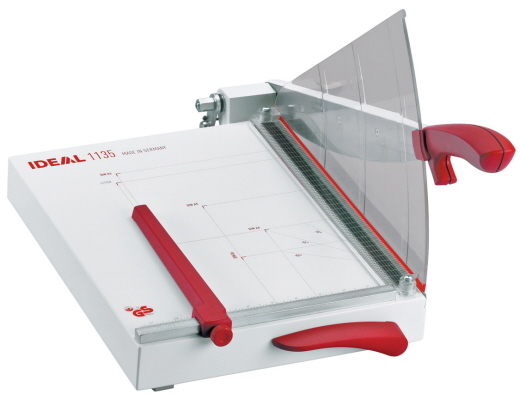 The Kutrimmer 1071 Paper Cutter is a large format trimmer model for commercial or business use. This office equipment is designed for light weight to heavy duty applications. Designed to be used on the table top, large desk or work bench, this unit delivers easy leverage when cutting stacks of up to 40 sheets of paper or other material. And it's not just limited to stock print matter!